In a previous post I already gave away 6 super useful survival tips to South India and as promised I continue the list, for you to enjoy, learn...and survive! 7. Don't ask leading questions. Rather than wanting to dissapoint you, every south indian will do his best to answer your question or explain the way, even if he has no clue what you are talking about. If then you offer them the easy opportunities such as 'Should I go this direction to arrive at the mall? ', the answer will undoubtly be a firm 'yes', though you might be walking the opposite way. Surely the good man believes you will arrive at your destination at some point, somehow, so it's not a real lie, right? 8. Never run when crossing the street. 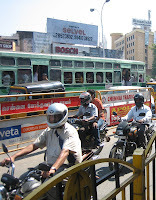 Crossing major boulevards in India is a balancing game that requires some skills and experience. In the beginning its easy to cross together with other locals, they are ALWAYS around anyway, but surely you will have to gather courage to give it a go alone someday. At that point, remember this primary survival rule and slowly manouver through traffic without any external sign of fear for the passing cars, bikes, rickshaws, cycles, pedestrians and mammels. Take firm steps and indicate the cars heading your way which way you want them to pass by. Thank God when you arrived on the other side. 9. Declare you are a student. It sounds pretty lame, but i've heard from several travellers and experienced myself that an imaginary student status facilitates bargaining. Being white you are considered a walking goldmine anyway (even if you are a poor backpacker or trainee), but it can help. Anyway it's better than coming up with the real story from which the salesman/driver will only pick up the keywords 'Sofware, America, Dollars, Manager', regardless of you actually mentioning them or not in your talk. 10. Confirm every sentence with ok,ok,ok,ok,ok and some head wiggling, that will make your conversation partner feel more comfortable talking to you. Even if you don't agree continue to say ok,ok,ok,ok,ok and end with a firm 'NO'. It's also pretty common to use the stop word 'correct' after every sentence, (pronounced 'Cerrect') as an acknowledgment of your understanding. This can end up in funny first meetings, when people reply 'Correct' to your birthdate or name. 11. Get a rabies shot. If you've read the Madras by night post you understand why. If you didn't you will understand the day you venture out at night and stand face to face with a dog that is not open to the idea of having foreigners in his hood (and is probably hungry too). Better to avoid dogs anyway I guess. A survial tip in the true sense of the word! gij vertoeft dus ook in India..Aant werken, rondreizen, studeren? Mijn vriend is hier als expat en ik ben hem dus gevolgd. Momenteel nog geen job, maja, we zijn hier ook nog maar twee weken!